There were 11 children in total born to Joseph Stewart and his wife ‘Fanny’ (Merinda) (née Audley from Newcastle-under-Lyme). Some were born in Church street, Bollington before the family moved to Rock Cottage, Beeston Mount, Bollington (between 1895 and 1900). 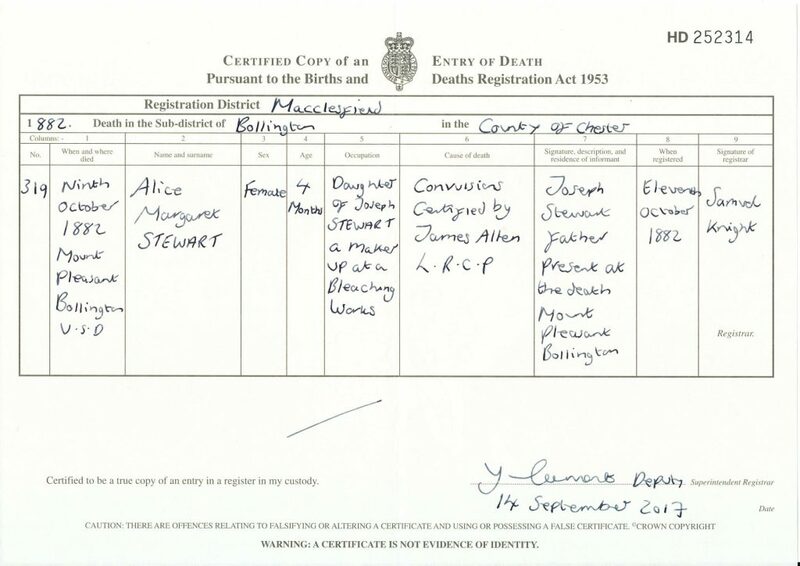 Two children died as infants: Alice at 4 months and George at 3 years. Two sons died in WW1 defending their country: Gordon and Hedley Stewart. 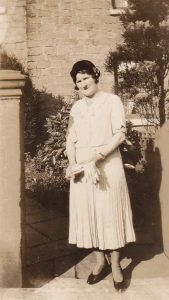 Alice Beatrice Stewart 1900- 1979. Refer to other pages for Hedley, Gordon and Donald. 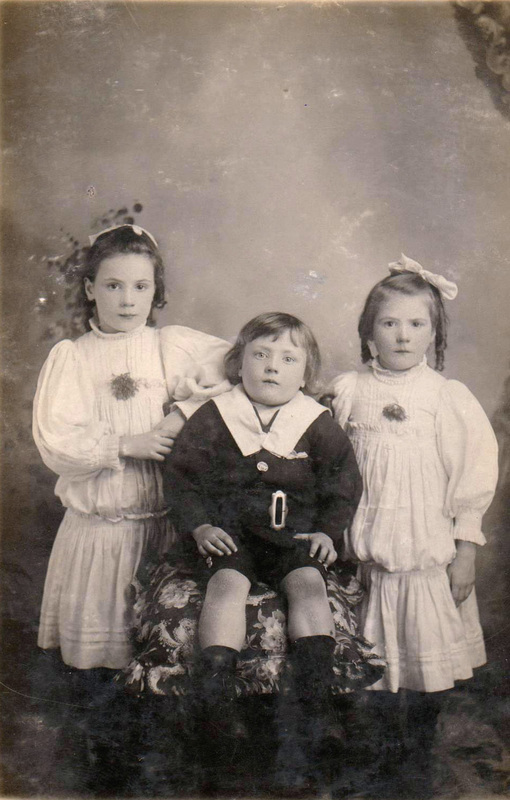 ‘Bert’ the eldest of the Stewart sons worked at Ingersley Vale Bleach Works. He was 31 when WW1 broke out, so possibly too old to sign up. He married Flora Belle Aked (1887-1938) from Handforth in about 1911. Robert lived in High Street for over 50 years until he died. 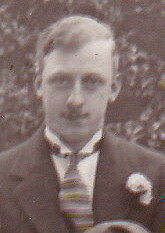 He and ‘Florrie’ had one child Dorothy Audley Stewart who married Philip G Norton. Dorothy died suddenly in November 1994, as a widow aged 82. 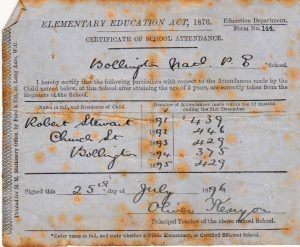 She lived in Ivy Lane, Macclesfield at this time. William was affectionately called ‘Billy’. This is his lengthy obituary (click on it to enlarge) which describes him as a funny happy go lucky man. He was refused entry to fight in the war due to health reasons. He died at just 35 yrs at home with his mother Fanny nursing him. She had earlier nursed him back to health after he had peritonitis! He had never married. 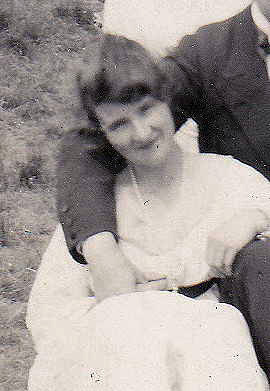 ‘Connie’ never married, she died of cancer in 1942 in Bollington and buried in St Johns Cemetery. 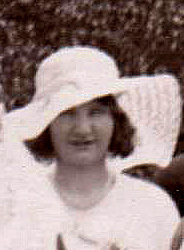 This photo of Connie was taken outside Rock Cottage around 1930. Click on the photo to enlarge. Norman never fought in WW1 for reasons unknown, possibly because he was too small. 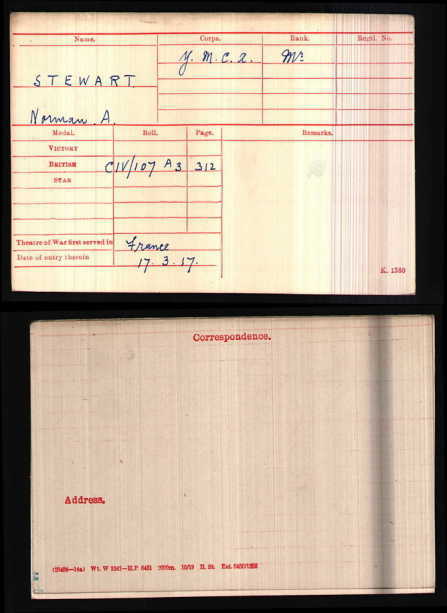 But he did go to France during the war and played piano for the YMCA for concert parties (see the form, dated 17th March 1917, left). 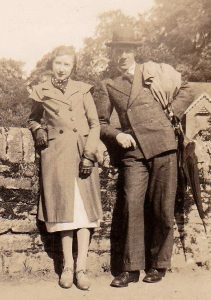 He worked for Oak Bank Mill before the war and also when he came home , before moving south and marrying Gertrude Walker in Aston, Warwickshire in 1921 when he was 25 . They had one daughter Beryl born 1922, who died in 2009. 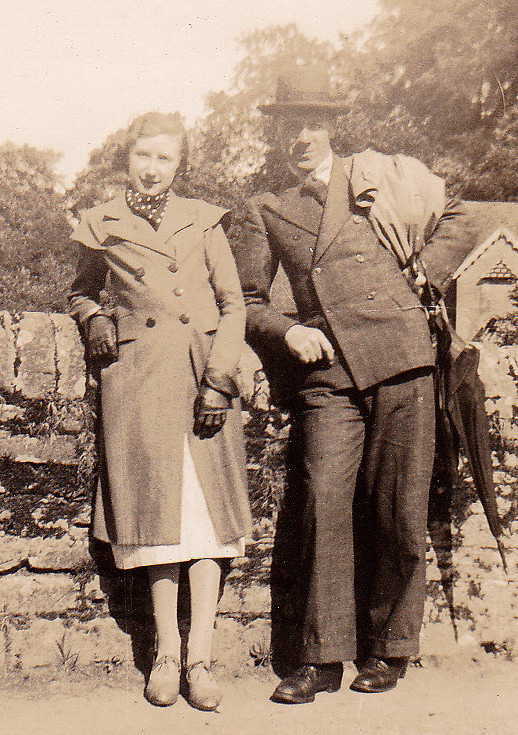 This picture is of Norman with a 14-year old Beryl (click on photo to enlarge). Norman married again after his first wife died, to Lillian Gaines when he was 64. He died in Bristol when he was 81 yrs old. 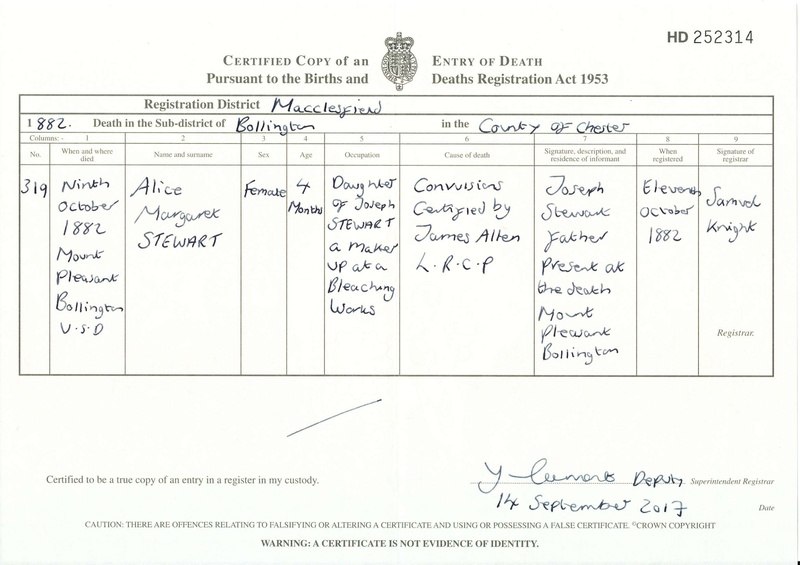 George died as an infant aged just 3 years. 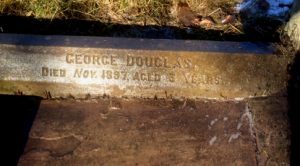 We know this grave (in St John’s church cemetery) is that of George Stewart (Douglas was his middle name) because further along this stone is the name of his brother William Audley Stewart. The engraving on the stone indicates that he died in November 1897, aged 3 years (click on photo to enlarge). 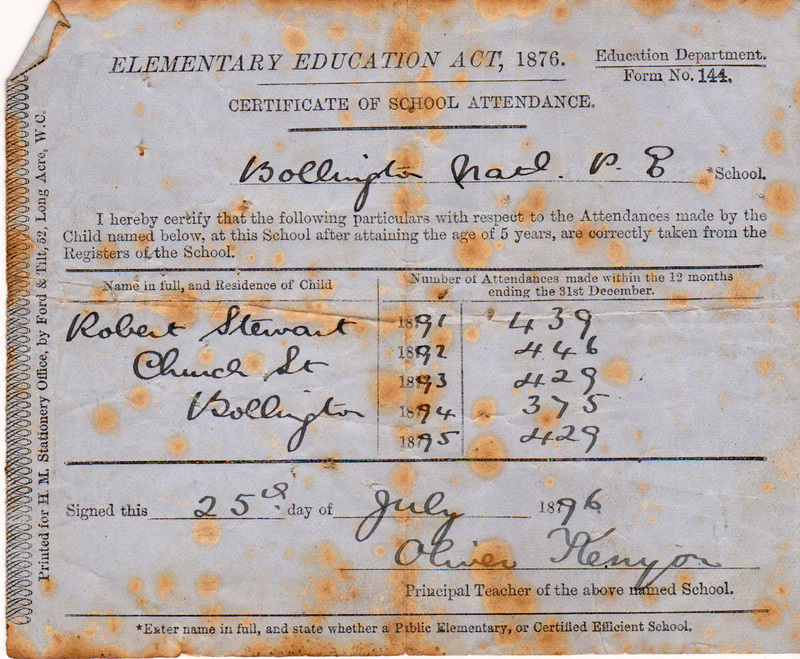 However, other records indicate that he was only 16 months old, and buried on the 11th March 1896. 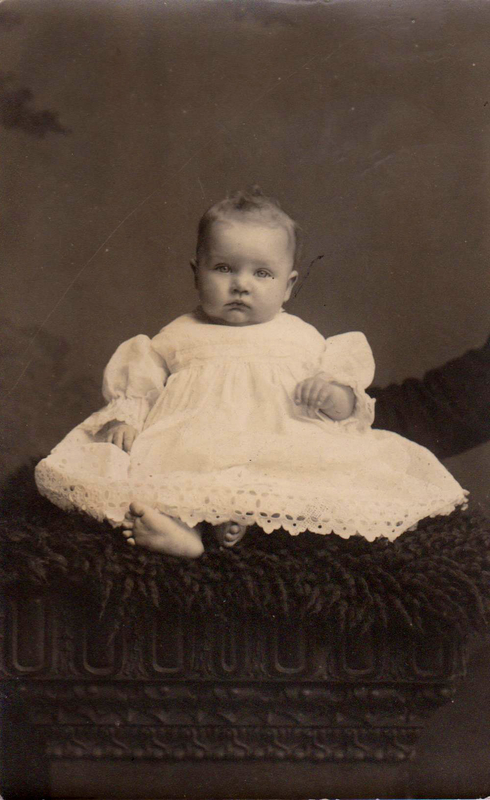 The baby photo is believed to be that of George. ‘Doris’ was the only child of the Stewarts who lived all her life at Rock Cottage, she never married. From 1942 (when her sister Connie died) Doris lived on her own there until shortly before her death in 1988 aged 91. After surviving there her whole life, she was put in a home, possibly Mount Hall on Flash lane, and died 3 months later whilst sitting at the dining table with the other residents. She was the longest surviving child of Joseph and Fanny Stewart. Doris had a few adventures later in life, she collected signatures of famous people all over the world and then sold them. She also sold her brothers war medals which is a great shame. She used the money to go on trips abroad on her own. She was quite a solitary soul. 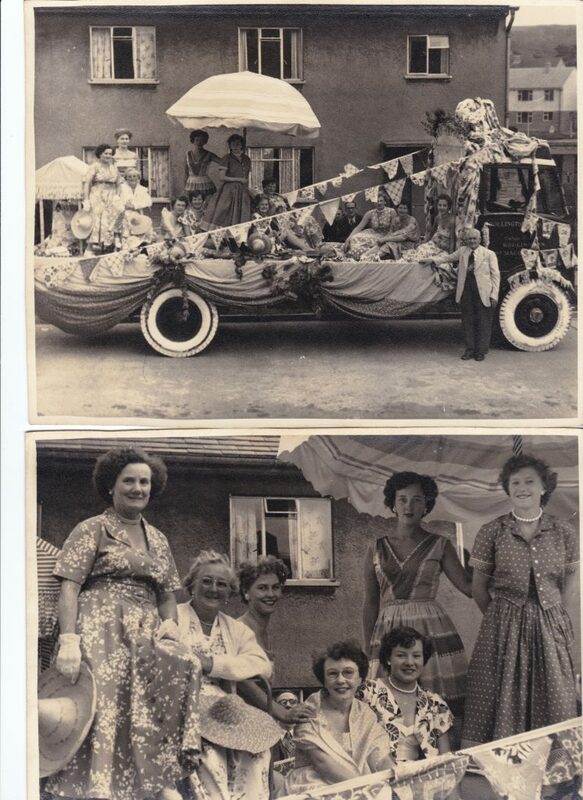 The following images show a newspaper clipping about Doris’ hobby, and of Doris on a float at Bollington Carnival in 1955. In the close-up Doris is on the left, with Mary Nolan, Joyce Hayman, Joan Walker, Cathleen ? and 2 others. The photo on the left is of Doris sitting on a bench on Beeston Mount in the 70’s. The photo above of 5 figures sitting in the sea (probably at Blackpool) is of (left to right) Doris, sister Beattie, brother Donald, Stella Ogden (later to be Donald’s wife) and sister Connie (click on photo to enlarge). ‘Beattie’ was the youngest daughter of Joseph and Fanny Stewart. She worked at Ingersley Vale Bleachworks and later married Fred Bamford 1894-1962 from Grimshaw Lane, Bollington. They moved to Dialstone Lane, Stockport and had one son Frederick Gordon Bamford 1922-1988. Beattie died in 1979 at the age of 79. 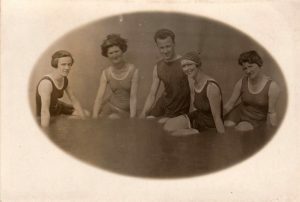 The following photos are of Beattie with brother Donald and sister Doris (click on photo to enlarge), and Beattie when she was in her twenties. U.S.D. on the birth certificate stands for Urban Sanitary District. 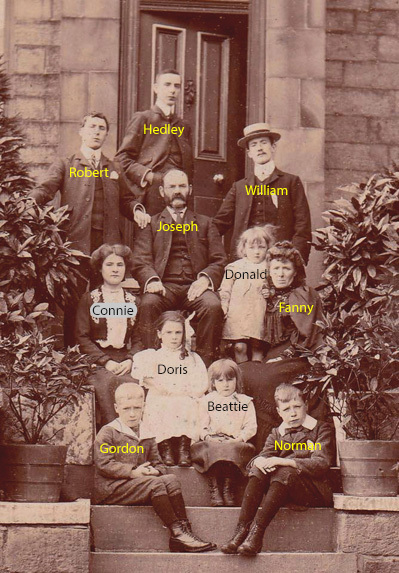 I am indebted to Linda Bester (née Stewart, grand-daughter of Donald) for this fascinating account, and photo collection, of the Stewart family of Bollington.